I don’t know why I was so concerned about this part of the poncho, it’s really relaxing to do and you have to concentrate a little bit so it occupies the mind and stills the weary worries (there’s a badly remembered quotation there and the book’s not in the same country as me at the moment so you will all need to wait on tenderhooks (no pun intended m’lord ) till I can look it up and correct this blog. It’s from something Edith Sitwell quoted. To give a basis at the bottom of the poncho, I could have made a chain of the required length… but where’s the prettiness in that? So the base of my cone (see what I did there? The trapezium has been joined at the sloping edge to make a cone so the geometrical name had to be changed to the 3D shape 🙂 ) now a lovely chain of flowers. 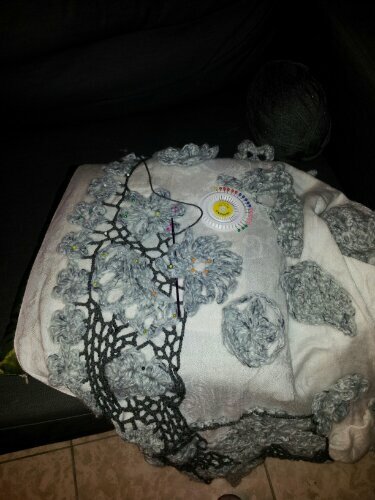 To start with, I tacked the flowers along the base of the cone then crocheted a filigree row basically 1 treble (US dc),4 chains and another treble (US dc) changing the treble to a double/triple, etc treble (US dc) as needed to keep the upper chain line level and take in the shape of the flowers. Once I had this basis, it was essentially a case of crocheting 1 tr (US dc) 4 chain 1 tr (US dc) until I hit a motif at which point, depending on the gap to leap I used any motif linking stitch which seemed appropriate. I usually do filigree from right to left and than turn the piece to do the next row. However the cushion’s in the way so I’ve found that chaining straight upwards is just as quick and the only thing to be aware of in making a treble is that instead of inserting the hook from front to back, it’s neater to do it back to front before collecting the third loop. The trebles are inserted into the centre of the block below which creates a hexagonal shape. When I pin, block and iron this I will emphasize a hexagon and not a rectangle. Speaking of pins, very important, can’t have too many and don’t ask a long suffering spouse to pick up a wheel at the supermarket; they will search for a long time, still not find them and return grumpy. 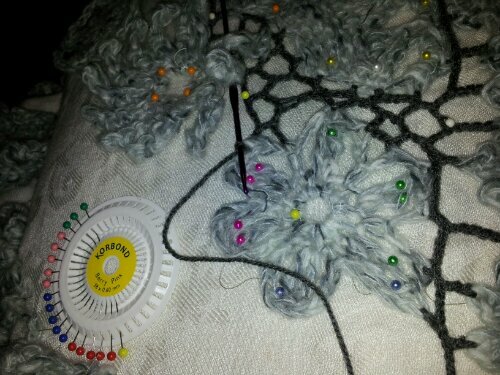 Pin out all the motifs at a little bit of a stretch and this evens the tension out. Don’t pin in the outer stitches you will be crocheting on but about half a stich further towards the centre of the piece. I’ve also found that 2 pins in the most central row keeps the spacing better. For me I found that the net is never tight enough, there is a little slack required in order to actually work it and by pulling the flower petal as wide as it can be, this compensates.